Summer is here! At last, the season of sunny days and evening fireflies has returned. But summer can also bring oppressive temperatures and high humidity. 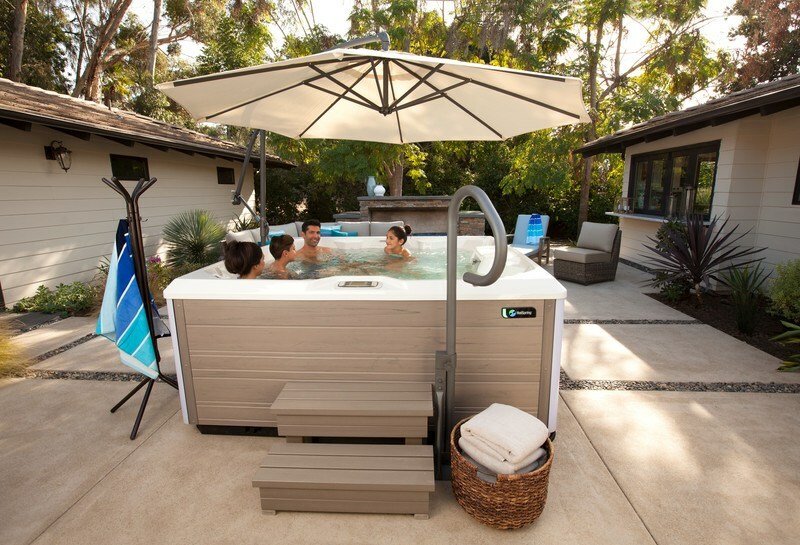 On those days, the hot tub that’s your paradise on chilly fall days, cold winter nights, and carefree spring weekends can seem like a cauldron, sending you in search of a cool shower and wondering if you can use a hot tub in summer. The fact is, there are many ways to use your home spa in warm weather, each more pleasant than the last. Here, we list a few of the best, including how to chill-out with CoolZone™ from Hot Spring®. Summertime means many different things to many different people, but it all depends upon where you live. Experiencing summer in the woods of Maine is very different than experiencing it in Los Angeles, for example. In a town like Big Piney, Wyoming, the “icebox of the nation,” soaking in a hot tub can be refreshing any time of year, but in the baking-sheet cities of the desert Southwest, it’s typically too hot during the midday hours for a warm soak, especially in the summer. The good news, however, is that even the hottest parts of the country aren’t hot all day. In areas with low humidity levels, temperatures start to drop as late afternoon wanes, and then bottom out late at night. The thermometer begins to rise again as the sun does. In many places, that means twilight, dusk, and dawn are ideal times to relax sore muscles in your hot tub’s soothing water. These windows of spa opportunity are even more open in cooler, northern states, such as Washington, Montana, Minnesota, Wisconsin, North Dakota, and Maine. Hot-tubbing at night can provide tranquility on par with sitting around a campfire and watching the stars–another popular summertime activity that turns up the heat in a different type of way. Enjoying your spa during the cool morning hours can help you relax and find balance in preparation for a long, hot summer day. While areas with low humidity are subject to drastic temperature ranges, areas with high humidity are subject to rain—Mother Nature’s way of beating the summer heat. In some regions, summer rains come daily, sometimes for weeks on end. A summer rain storm can break a hot spell in a snap. The cool peace that follows is an invitation to appreciate the earthy scent left behind and melt into the bliss of your home spa. If you’re seeking unique tranquility, and there is no threat of thunder and lightning, you can even use your hot tub during the rain. Sit back and enjoy the cool rain on your face as the rest of your body indulges in warmth. Summer is a highly social season—a time when friends and family get together for barbecues or to just while away hazy days in backyards, on patios and decks, and, of course, in hot tubs. Spas with entertainment systems provide the music to match your party’s vibe and the sports and films your guests love. From classic tunes and the latest beats to big games and summer movie marathons, Bluetooth® technology allows you to connect your home entertainment system with your spa’s remote controls. You can change the music, turn up the volume, and more while you’re flipping burgers. Entrancing spa waterfalls and fountains augment the mood, and multicolored LED lighting ushers your gathering into the night, setting the stage for fun hot tub games or stargazing. There are many ways to enjoy your spa in the warm summer months, but the most refreshing is with an enhanced temperature control system, such CoolZone from Hot Spring®. When you crave a cool dip on a sweltering day, but don’t have ready access to a swimming pool or beach, your hot tub can come through for you. CoolZone can lower the temperature of spa water all the way down to a brisk 60 degrees Fahrenheit and heat it back up again to enjoy in cooler evening temperatures. Step 1: Wake up with a warm soak to gain focus and energy. Step 2: Take care of business as the morning gets going. 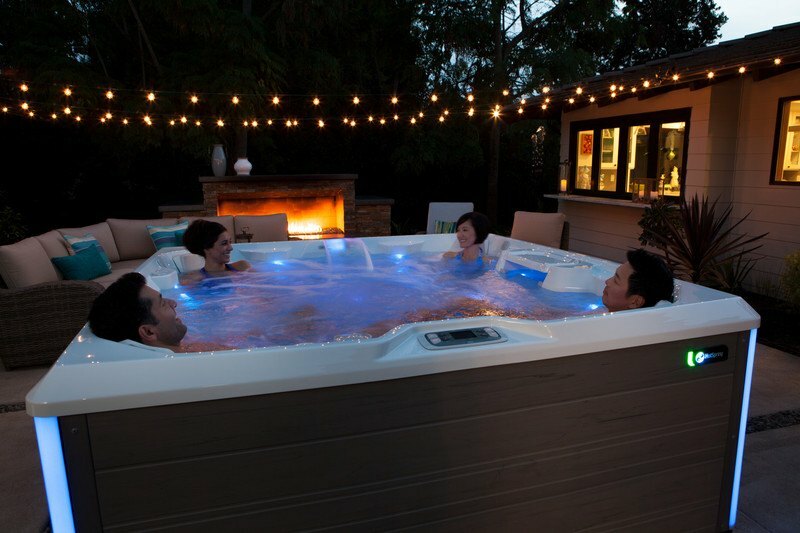 Step 4: Raise the hot tub temperature after dinner to stave off the evening chill with friends and family. In addition to all the fun you can have hot-tubbing during the summer season, there are health benefits you may experience. After exerting your muscles in the yard or at the gym, your hot tub can help reduce soreness and aching. Not only can a warm spa help release tension, but the buoyancy of the water and the massaging effect of powerful jets contribute, too. 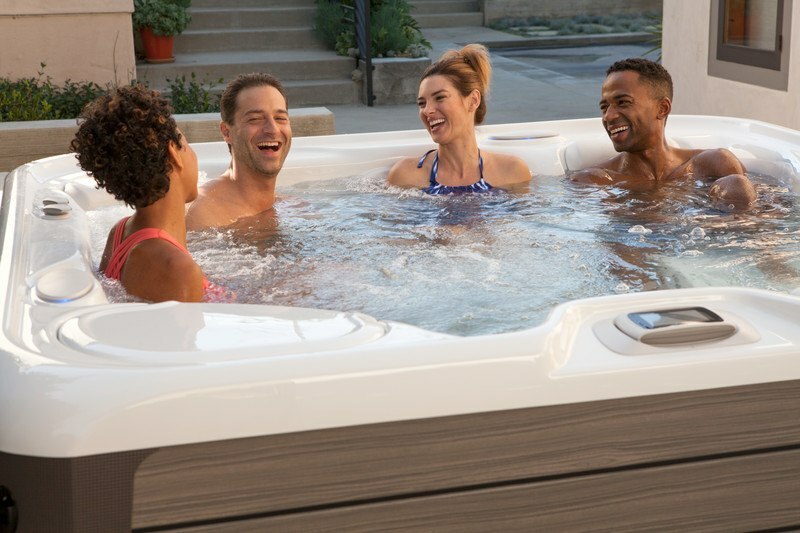 Plus, enjoying your hot tub with friends and family can help to improve social connections, as well as your overall quality of life. When the day is done, a 20-minute soak before bed can help improve your sleep. Owning a hot tub is a joyful experience, no matter what the season. Your spa routine can help anchor your day, your week, or your year, even when the heat turns up—your hot tub will reward you every day you use it. 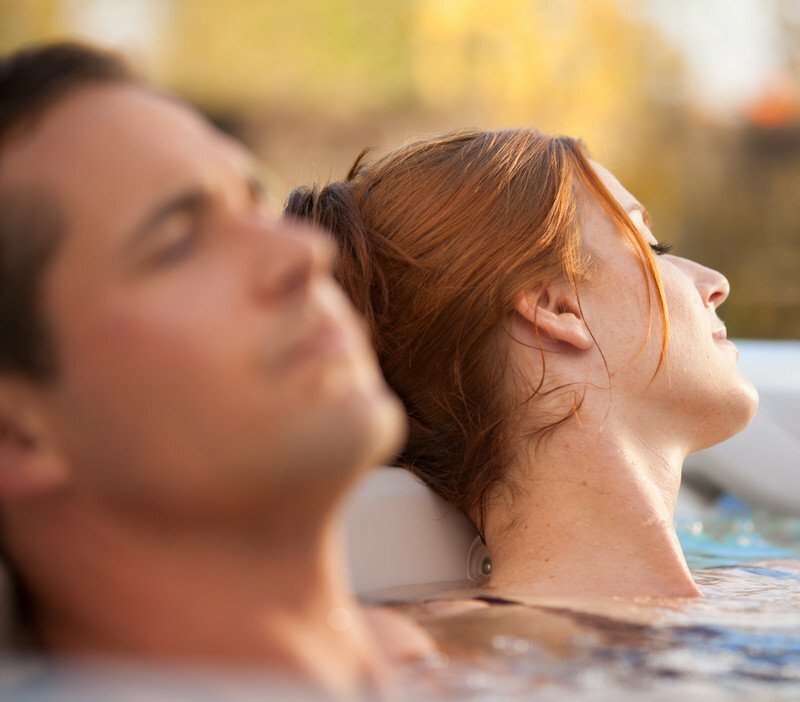 At Continental Pool & Spa, we hear firsthand of the positive impact hot tubs have on our customers’ lives. From the winter solstice to the dog days of summer, a home spa provides endless opportunities for relaxation and enjoyment. If you’re interested in purchasing a durable, high-quality hot tub this summer, request a price quote.